In December 2006, we brought home 4 very anaemic-looking, thin, threadbare ex-battery hens. A few weeks on, I could look out into my garden and see 4 very plump, glossy-feathered ladies pottering about, quietly chatting away amongst themselves whilst undertaking any one of their daily activities – preening, dustbathing and scratching for worms, grubs and the like. My girls positively blossomed. They were very happy hens. We were lucky enough to find out about the work of the BHWT (formerly the Battery Hen Welfare Trust, now the British Hen Welfare Trust), our first encounter with a commercial hen rehoming organisation. Although battery hens in the UK are at least supposed to be a thing of the past, commercial hens in cages are still very much a reality. The BHWT and their counterparts, including Little Hen Rescue, Lucky Hens Rescue, Fresh Start for Hens and even the RSPCA co-operate with farmers to come in and take the alloted hens once they are ‘spent’. This basically means that although they may still be laying, they are not considered to be at peak production. Rather than going to slaughter to end up in pet food or pies, they are taken away by the regional co-ordinators from hen rehoming organisations and given a good retirement in their new homes. Here they can learn to do everything that they were deprived of – socialise properly, dust bath, scratch in the mud, sunbathe, and of course, lay their eggs. 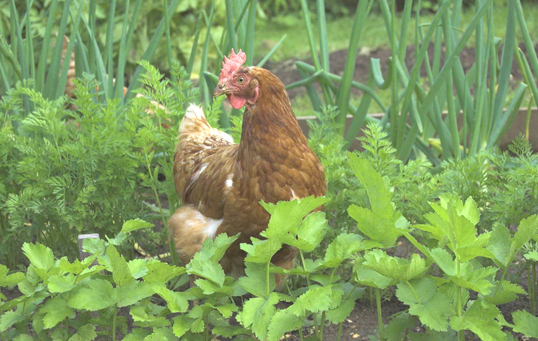 Despite being classified as ‘spent’ hens, our rehomed hens gifted us with three or four eggs a day from just four hens. With only two people in our household, we struggled to use all our eggs, despite baking a cake every other day (yes, really!) and making copious boiled egg sandwiches. So friends and family helped out, and our ‘girls’ were regularly complimented on their ability to produce such wonderfully tasty eggs. Apparently you really can tell the difference between an egg produced by a hen in battery conditions and an egg produced from a truly free-ranging hen. Our ‘girls’ were with us between 2006 and 2009, with Maureen and Yoko departing this earth for the big chicken coop in the sky within 10 days of each other. They enriched our lives so much – I never thought 4 chickens could make the difference that they did. And they’re not as stupid as you might think! Common Sense? Oh, minimal at times. Ability to learn and adapt to their environment, despite months of a barren existence? Inherent. They got to know my call, they knew what time of day to expect their daily ‘pasta time’ treat. They learned to put themselves to bed, politely took turns in the nestbox, and were great weeders and a top pest control team as far as my veg patch was concerned. They cost next to nothing to feed and provide bedding for (straw and newspaper) – the cost only really came from the initial house purchase. Added in their four distinct and completely endearing personalities, and you understand why we were so besotted with our feathered friends. So if you want to make a difference, ant to try and really make a difference? Then adopt a few battery hens! You won’t regret it.